Vancouver, B.C., June 12, 2018 - Titan Mining Corporation (TSX:TI) (“Titan” or the “Company”) today officially opened the Empire State Mine (“ESM”) at a ceremony attended by George Pataki, a director of the Company and former Governor of New York State. Titan also provided an update on production from March 2018, when milling commenced, through the end of May. Average mill throughput at ESM has ramped up steadily from 443 tons per day (“tpd”) in March, at a grade of 10.4% zinc, to 584 tpd in April, at a grade of 8.0% zinc. In May, mill throughput averaged 776 tpd at a grade of 8.1% zinc and a recovery rate of 93.7%, showing a strong uptick in monthly performance. ESM #4 mine continues to progress well towards the production milestone of 1,800 tpd in early 2019. It is anticipated that commercial production will be declared in the third quarter of 2018. Since the start of refurbishment and rehabilitation in November 2017, the workforce on site, including contractors, has increased from 24 to more than 200 people, of which approximately 74% live locally. All of the surface and underground infrastructure that is necessary for production has been successfully put back into service. 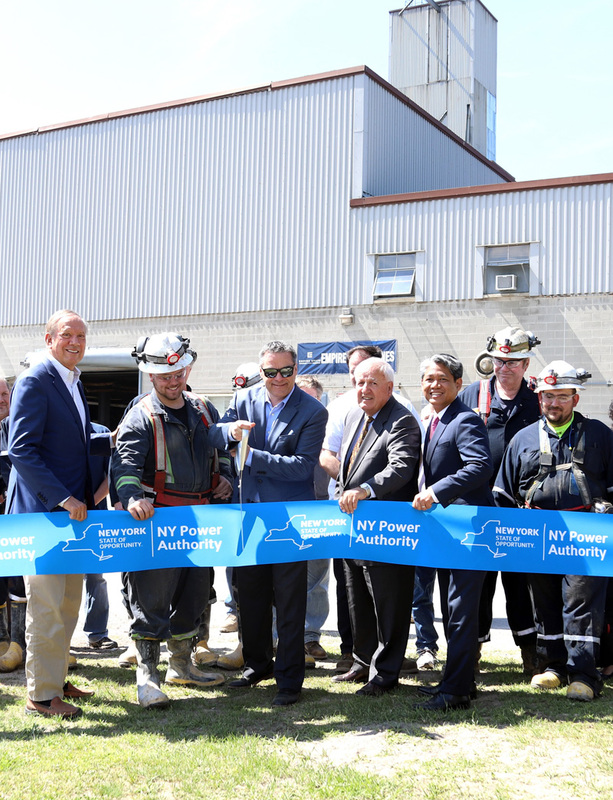 A miner training program has been developed and implemented as part of Titan’s localization initiative, and is supported by $380,000 in funding from the New York Power Authority (“NYPA”) and Workplace Development Institute. This program is expected to benefit the operation by reducing dependence on non-local hiring and by developing skills ahead of an eventual transition from contract mining to owner mining. The first group of seven trainees is expected to complete their program and be deployed in the mine at the end of June, with training of the second group to start in July. Left to right: George Pataki (former Governor of New York State and Titan Director), Austin Juillet (Miner Trainee), Keith Boyle (Titan COO), Judge Eugene Nicandri (NYPA Board of Trustees Vice Chairman), Gil Quiniones (NYPA President and CEO), Darrel Johnson (Miner Trainer), Alex Arbogast (Miner Trainee). Titan is a Canadian-based zinc exploration and development company which has as its principal asset the Empire State Mine in the State of New York. For more information on the Company, please visit our website at www.titanminingcorp.com. This press release contains certain forward-looking statements. Words such as “expects”, “anticipates” and “intends” or similar expressions are intended to identify forward-looking statements. Forward-looking information is necessarily based on a number of opinions, assumptions and estimates that, while considered reasonable by the Company as of the date of this press release, are subject to known and unknown risks, uncertainties, assumptions and other factors that may cause the actual results, use of proceeds or timing of events to be materially different from those expressed or implied by such forward-looking information, including but not limited to the factors described in greater detail in the “Risks and Uncertainties” section and other sections of the Company’s Management’s Discussion and Analysis for the year ended December 31, 2017, available at www.sedar.com. No securities regulatory authority has expressed an opinion about the securities described herein and it is an offence to claim otherwise. Titan undertakes no obligation to publicly update or revise any forward-looking statements, whether as a result of new information, future events or otherwise, except as may be required by law.